The river that flows through Deloraine is the "Meander River". Its banks are as picturesque as any river you would choose to visit. As Deloraine is an "Arty" community the beauty is enhanced by some amazing art. 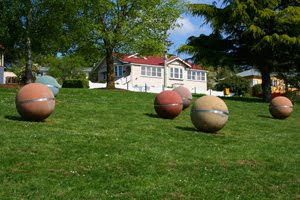 One example are these huge balls suspended in motion as they roll down the hill toward the water. 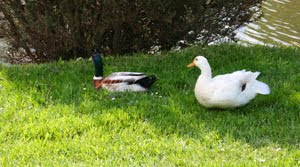 There was also love in the air with these two ducks playing out their mating rituals. 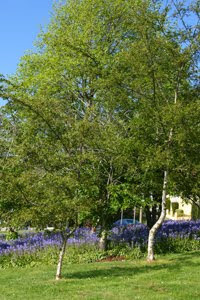 The beautiful mauve flowers under the trees were a beautiful sight to see. It truly is a relaxing place to wander along the "Meander River"
Wow, more beauty. I love your photos, it looks so calm and serene and it looks like a place which would be wonderful to visit for a day, a week or even a month! Hi Darlene - Tasmania is a very special place on this planet we call home. I am pretty bias but it is so peaceful and the locals are very friendly.